The holidays are over and it’s cold. Everyone is getting back into their normal routine and we are braving the cold weather as we go about our days. This time of year also brings colds and other illnesses that can make anyone downright miserable. 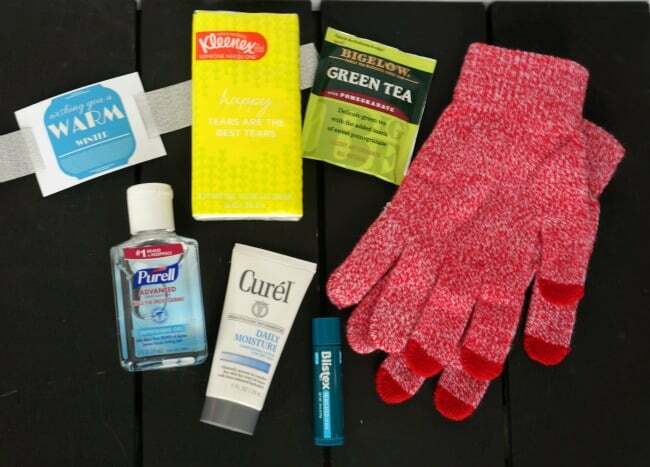 Today, I put together an easy gift that you can give to just about anyone this winter to help keep them warm, cozy and healthy. And who wouldn’t appreciate a little something to brighten a dreary winter day? 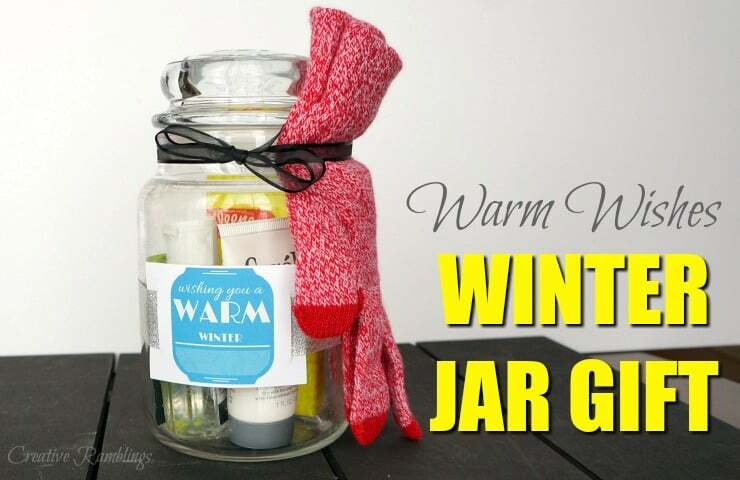 Take a look at how easy this winter jar gift is to put together. 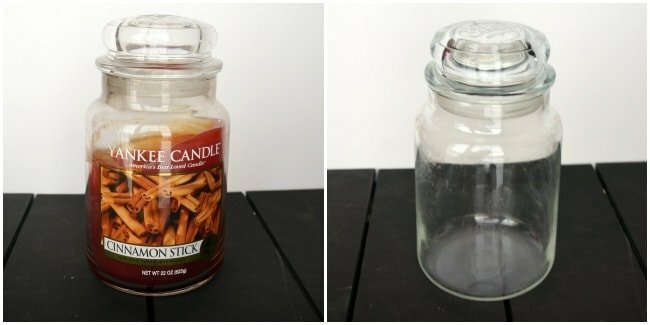 I opted to use an empty candle jar for this gift versus a mason jar because I had it on hand and even after cleaning it out it still smells so good! To clean out this candle I placed it in my sink filled halfway with hot water. Then I poured a kettle of boiling water into the candle and let the wax float up to the top. As the water cooled I scooped the wax out and threw it away (do not let the wax go down the drain, it may clog pipes). I washed it good with soap and water to get any remaining wax out. 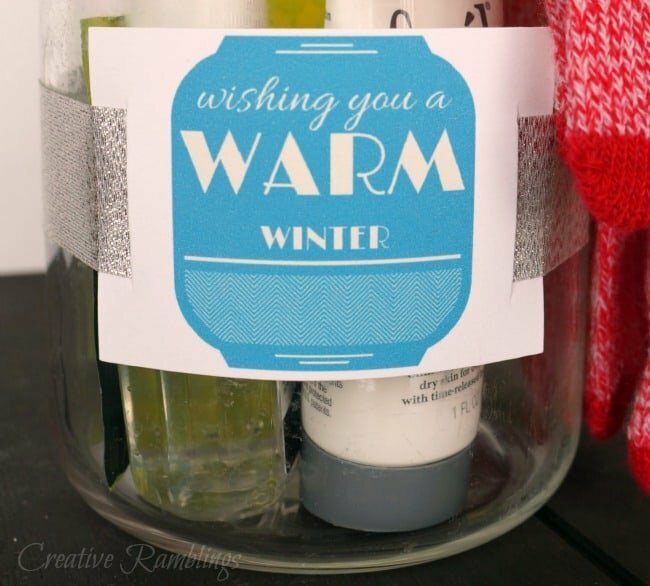 I filled up the jar with all these winter essentials then tied on a pair of cozy mittens. Then I wrapped a simple tag around the jar and it’s ready to gift. You can download and print this little tag below and put together your own warm winter gift. What is your go-to winter gift? The Anatomy of a Jar Gift, your guide to creating the perfect jar gift every time. This guide is exclusively for Creative Ramblings subscribers. Click Here to subscribe and download this guide as well as other freebies from Creative Ramblings.